Have you confused by how to make a video slideshow with pictures to play at your birthday party and not sure which video slideshow software you would get to create an individual slideshow with you holiday pictures and videos? Here you will get right answer and enjoy a wonderful video slideshow making journey. As a powerful photo dvd slideshow tool with intuitive interface, Photo MovieTheater has undergone several times upgrade and continue to bring users absolutely new experience in making video slide show. The program not only helps you burn your video slideshow to DVD disc to be watched on TV or PC, but also allows you to upload your video slideshow onto YouTube for sharing with more friends, download to iPod, or iPhone or other portable players to view anytime. What can Photo MovieTheater do? Let you experience unparalleled easy and intuitive making process. Provide various transition styles to enhance your photo slideshow free and creatively. 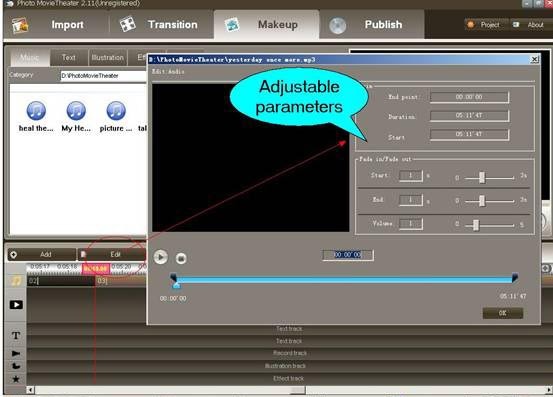 Enable to customize decoration effects like background music, text, illustration and record. 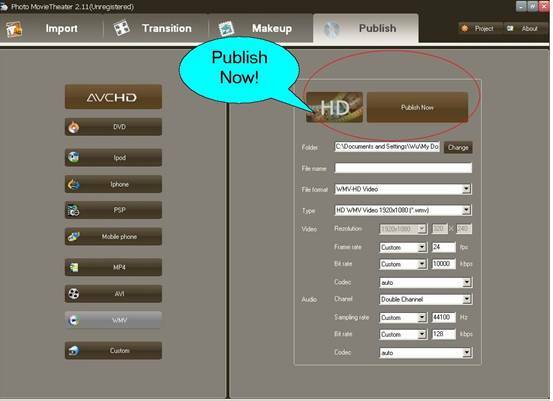 Support more than 40 output formats including AVCHD H264, AVCHD Mpeg-2, DVD, MOV Mpeg4, and numerous devices like PS3, Apple TV, Ipone, Xbox etc. 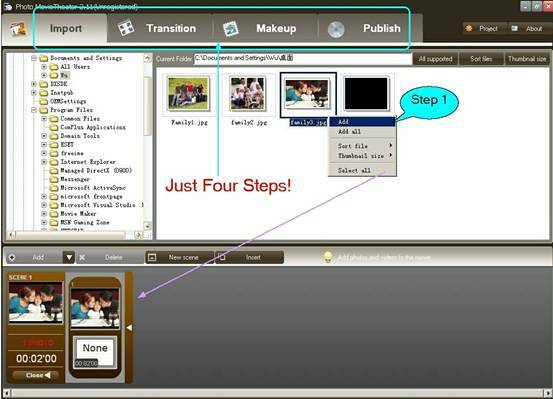 Need no special skill, here it will show you how to create slideshow in simple 4 step. Just follow this step-by-step tutorial. It is quite easy. Download Photo MovieTheater Buy a full licence of Photo MovieTheater to start now! Lauch Photo MovieTheater software and and the program will go to browser your computer's video clips and photos automatically. Drag-and-drop photos to the storyboard below to proceed further operation. Tip: You can also right-click the pictures and click “Add” to import photos to storyboard. Phtos: *bmp, *.gif, *.jpg, * .jpeg, * .png, * .tif, *.tiff etc. 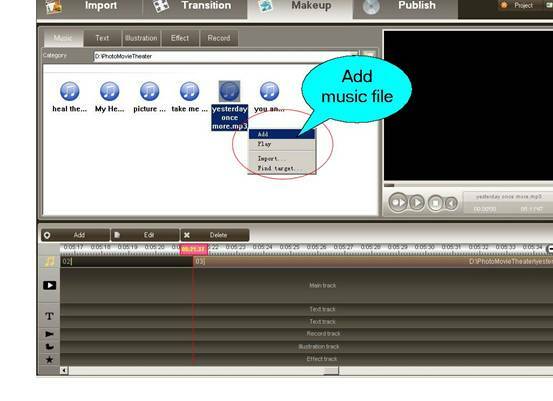 Go to 'Makeup' Tab to add your favorite music, effect, record onto your photos and decorate with caption, narration, illustration. Local music folder files and your own record are available to apply to the video slideshow. To match your slideshow, you could also trim the sound file through “edit” function! Publish your photo slideshow. At last, you are just required to select an output format. 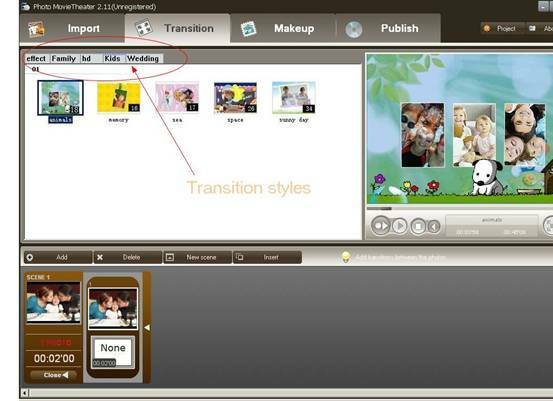 Please publish it to MP4, AVI, WMV formats if you want to upload your video slideshow on YouTube. Besides, you can also burn it to DVD to share on TV, PSP, Xbox or other portable devices. Tips:The output quality is also up to your choice, you may select "HD" or not.